A Professional Artist's Studio in Red Deer, Alberta. Monday, Dec 20th to Thursday, Dec 23rd. Open regular hours starting January 4th. Please email us with any questions or concerns. You can also make an appointment, for special Gallery visits. Thinking someone in your life is the hardest person to buy for? At Gallery IS you will find the most unique items. You cant find these one of a kind, fine artworks anywhere else. Its the perfect alternative to big box shopping. On Monday Nov 22nd, from 6:30 - 8:30pm, you will have the opportunity to get first choice of the miniatures, and other fantastic items the Gallery will have available. This is a limited opportunity to visit the Gallery in the evening, on a day when we are not normally open. The Miniatures Exhibit is a cash and carry show. It will be on display from Nov 23rd to Dec 31st, 2010. Gallery IS will once again be hosting its Annual Miniatures Exhibition. This is an open group show, which features small works of art in all media. We encourage all artists to submit to the Gallery for this exhibit. We gear the artwork to people who are looking for that special gift. -2D works must be 100 square inches or smaller, and 3D works must be 6 inches tall or less. -We encourage all media, and are interested in different interpretations. In the past we have had tiny felt shoes, handmade necklaces, pendants and bracelets. Paintings as small as postage stamps, and small handmade boxes. - All media are acceptable. - Professional, emerging and student work will be considered. - We are only accepting 3 submissions per artist for this exhibit. If your work is chosen to be included there is the possibility to show up to ten artworks (so get busy). Please send us via email; your Artist Statement, 3 jpeg files representing the style of your miniature artwork, an accompanying list for the images (including title, size, and price information), and how many pieces you will have available for the exhibit (2, 5, 10?). The deadline for submissions is Saturday, November 13th. Notice of acceptance will be given by Tuesday, November 16th. Delivery of accepted work must be made by Saturday, November 20th. Official show dates are November 23rd, 2010 to December 30th, 2010. Please send all submissions to our email address, galleryis.arts@yahoo.ca. If you have any questions please feel free to email or call us (403-341-4641). Gallery IS presents "Compute This! 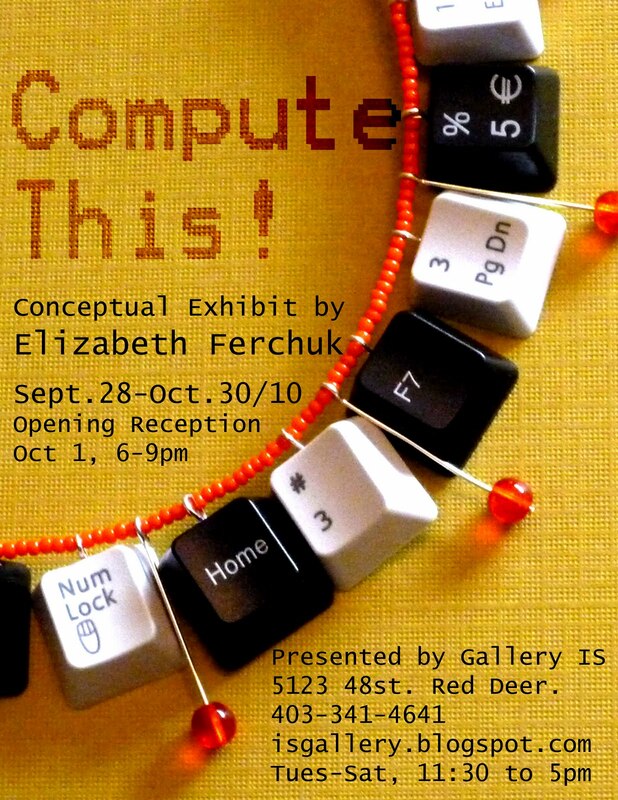 ", a new feature exhibition by Local Jewellery Designer, Elizabeth Ferchuk. "Working as a technology tutor, I always wondered what it would be like to create something out of the computer parts that I saw every day. I always found myself thinking, 'How can I combine my love for beading and jewellery design with these keyboards keys, wires and computer chips?’. That’s what brought about my idea for “Compute This!”, my conceptual jewellery exhibit. While creating and working on my pieces for this show, my main focus was to have fun and to be creative. I wanted to produce pieces that aren’t your common everyday ones, something out of the ordinary. Even though my methods of creating are traditional, as in my usual jewellery designs, the materials aren’t. I have combined computer keys, wires, chips, beads, and crystals into wearable art for the Techno Goddess. Even the colour schemes are based on computers and technology. As companion pieces, I have also incorporated some cross-stitch pieces into the show. I drew the subjects from online chatting and texting. They represent the symbols and new language of our modern, everyday life. " This exhibition is on display from Sept 28th to Oct 30th. Opening Reception is First Friday, Oct 1st from 6-9pm. These two pieces are brand new paintings by Rikki Renard. These are beautiful in person, with her classic soft, zen like style. They are both featuring a really cool hanging system, which includes the dark bamboo wood at the top. Please contact the Gallery if you would like more information on these works. This Saturday, September 18th is the Alexander Way Artwalk and Alberta Arts Day festival. There are a lot of really cool and fun activities happening right next door to the Gallery! It is all happening around the corner from us. A hop, skip and a jump away. Come Downtown and check out all the new artwork. Vivian Bennett, and Jeri-Lynn Ing will both be painting Plain Air during the day, on the street. Its a great chance to see a painting being created. The Artwalk goes from Noon to 6pm. Remember to stop by and say Hi. Gallery IS presents new work from Viv Bennett. Please stop in and see these new pieces at the gallery. Gallery IS, is pleased to present a new series of paintings by Susan Delaney. 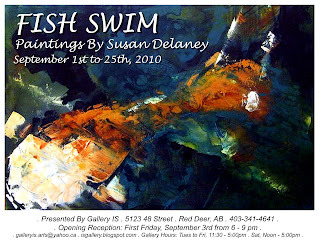 "Fish Swim" will be on display in Gallery IS from September 1st to 25th. Opening Reception is First Friday, September 3rd from 6-9pm. "I associate fish with the ultimate in mindful presence and here-ness. This work explores tensions between that way of being in the realms of the recognizable, the abstract, the symbolic and the actions of the artist on the canvas. " Susan is a graduate of the University of Western Ontario, with a Bachelors Degree in Art History and Criticism. 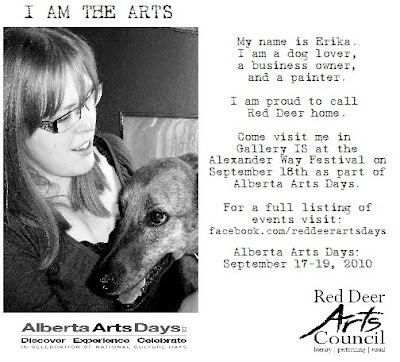 She is also a graduate of the Red Deer College Fine Art Program. Originally from London Ontario, Susan is now an active participant in the local art scene. She has participated in many local group exhibits, and charitable fundraisers, and well as being the recipient of many scholarships and awards for her artwork. First Friday! 6-9pm, Friday Aug 6th. Vivian Bennett is once again represented at Gallery IS, and we are taking this opportunity to showcase some of her new paintings. Sue Barker. If you are local, you have to have heard this name before. Sue is a brilliant watercolorist, and we have an amazing series of Poppies you must not miss. Linda Daoust is a Calgary based artist who has exhibited from BC to Quebec. Her organic abstract paintings will be a delightful change from the ordinary, and not to be missed during their short stay. The exhibit runs from Aug 3rd to Aug 28th. July brings us Glenda Ganz's Solo Show- Eclectic Collage- and here is a sample of her brightly colored collage. They are inspired by pop art and Japanese culture. The combination is strong: powerful colors meets subtle line and design. You will not want to miss out on this show. See you First Friday- July 2, 2010 for the opening reception -the artist will be in attendance. ...renovations are complete and they look great. We have added 100 sq ft to the back of the space expanding the exhibit space. The difference this makes is remarkable. Hope everyone gets a chance to drop in a see whats new and check out the new space. We are so happy with the changes. Vivian is back with the Gallery IS- she will be joining our group of core artists and will be displaying on a regular basis with the Gallery. We are pleased as punch to have her work in the Gallery once again after a brief time away. Vivian is known for her bold color and distinctive style. Drop in to see what is new with Vivian. The Gallery is Under Construction! Finally we are underway with our little expansion. We will be adding an extra 100 square feet to the back of the space over the weekend. With this in mind we will be CLOSED while the construction is ongoing. Closed Friday June 25th to Tuesday June 29th. Open again on Wednesday June 30th. We hope to see you all in the next week to check out the improoved space. "Eclectic Collage" will be the feature exhibit in Gallery is for the month of July. This will be the first solo exhibit by Glenda Ganz, a local designer and artist. The inspiration for this collection of collages comes from her love of materials that are readily available, often overlooked, traditionally used for another purpose, and have a global feel. Visit us from June 29th to July 24th, 2010. Opening Reception will be Frist Friday, July 2nd, from 6:00 - 9:00pm. Everyone is welcome and the artist will be in attendance. "Growing up in a family of artists and musicians provided an environment and strong foundation for Glenda's artistic expression. Glenda has an extensive portfolio in print media, graphic and interior design and brings elements of these creative processes to her current works of art. Exploring different mediums and materials provide opportunities to achieve her unique interpretation of the world and produce art that inspires conversation, enjoyment, and adds a layer of texture and color to personal spaces. Glenda's art is an ongoing process of change and growth. Concepts can be spontaneous or developed over a period of time." In June Gallery IS will be hosting something a little different from its regular fair, but really exciting. We are so pleased to be hosting an exhibit by local Author Sara Dudenhoffer. 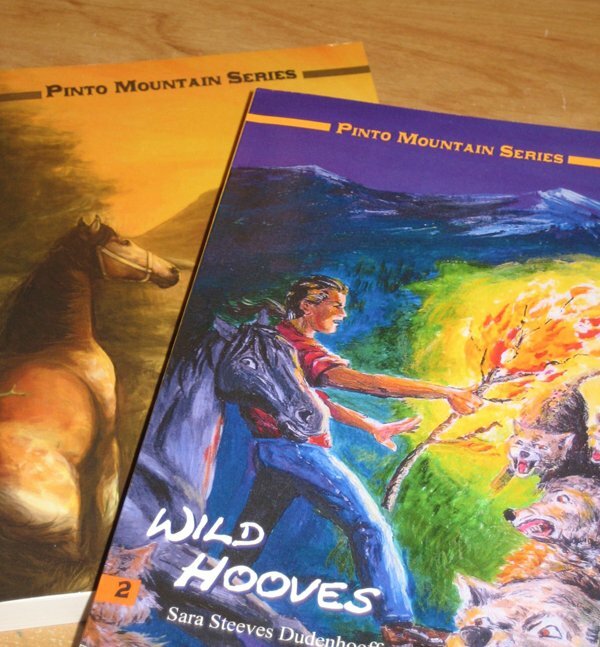 Sara has self published two Young Adult novels and has recently illustrated, and published, a Childrens Book. 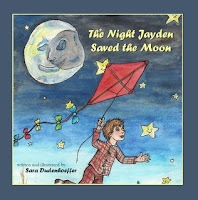 "The Night Jayden Saved the Moon"
From June 1st to 26th the original illustrations from 'The Night Jayden Saved The Moon' will be on display, and the Gallery will be facilitating the sale of these books. 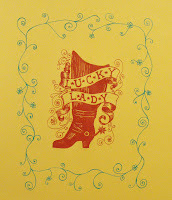 On June 4th, as a part of the First Friday series, Gallery IS will host a Reading and Signing by Sara. She will present an excerpt from her books as well as sign copies. Opening reception for 'The Night Jayden Saved The Moon' is from 6-9pm. Readings will take place between 6:30 and 7:30pm. Children of all ages are welcome, and encouraged, to attend! The Red Deer Express newspaper gives out awards every year for The Best of Red Deer. Among the catagories is 'Best Art Gallery'. We would love you forever if you would vote for us. Seriously, it would mean so much. 1. Click the link to be taken to the online survey. 2. Fill out your information to be entered to win $500.00. 3. Skip to page two and write 'Gallery IS' at the top of the page, under 'Best Art Gallery'. 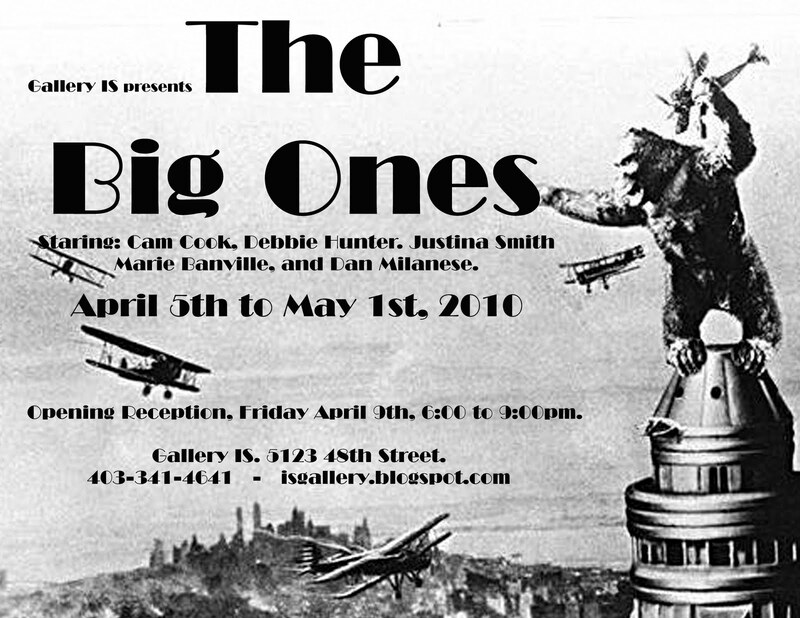 Gallery IS, is once again hosting the first solo exhibit by a great local artist. 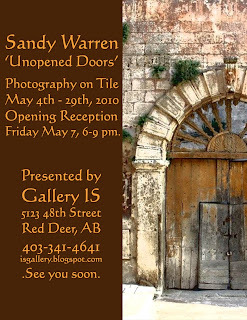 'Unopened Doors' will be the first exhibition by up and coming photographer Sandy Warren. Sandy creates some really wonderful pieces by combining her lifetime of travels in Italy, with a unique decorative style. 'Unopened Doors is a collection based on photographs taken during my travels to Italy over the last ten years. My passion for Italy has led to many trips where I have taken innumerable photographs in an attempt to capture the essence of everything that I love about the country. One of the main focuses of my photographs is doors. Doorways in Italy are like the people of Italy….every one is striking in its own unique way. What lies beyond the entrance remains a mystery in most cases, but our imagination allows us to envisage anything. Sitting in the shadows of an ancient cobbled street, a dilapitated door that appears to have been unopened for many years may actually open onto an amazing courtyard brimming with life. Each photograph is reproduced onto a tumbled travertine tile to merge the look of the architecture of Italy with the weather worn appeal of travertine. The completed tiles are then displayed individually or grouped together and framed on metal or wood to make a complete statement. Please join us for the Artist reception on First Friday May 7th, from 6-9 pm to celebrate this achievement. The exhibit will be on display from May 4th to 29th. If you would like to be kept up to date on the Gallery IS in your facebook news feed make sure you join our group. We will be posting on our current exhibits, when we feature new artists, or even favorite artists. We will also let you know if there is an amazing sale, show, festival, or other event that you shouldn't miss out on. Then there will be the auctions! You read that right. Awesome opportunities will be presented to bid on works by the Gallery IS artists. You could take home an excellent piece of artwork for an equally excellent price. From April 5th to May 1st, Gallery IS will be featuring the artwork of five artists we think you should know more about. "The Big Ones" is all about painting big. Big canvas's and dramatic effects. The opening reception for this exhibit will be Friday, April 9th from 6-9pm. We are in the process of figuring out a new design for the Blog. A visit to this site might be a bit like watching someone with Multiple Personality Disorder, because every encounter could look different. Once we have decided on a final 'look' for the blog there will be no more changes, but in the mean time please be patient with us. A preview selection of the work to be featured in Val's upcoming March exhibit "Fashion Becomes Art". 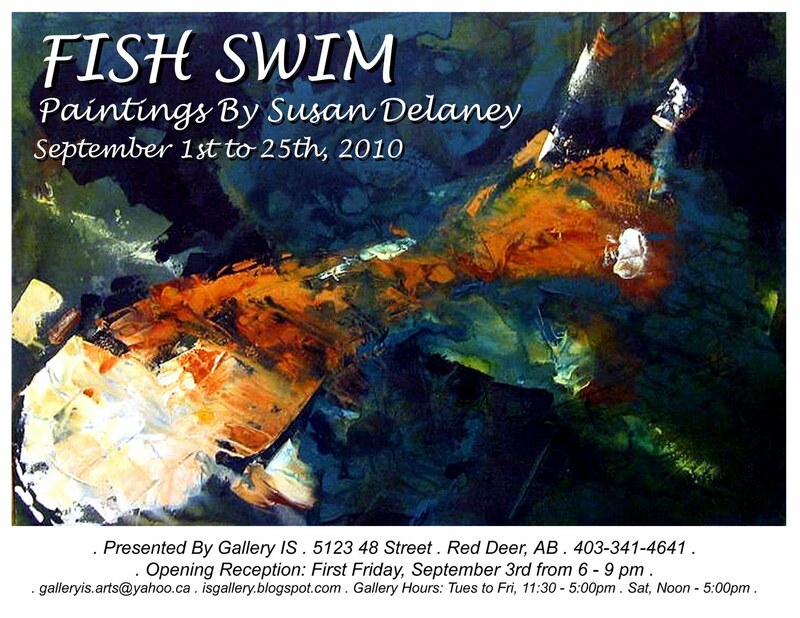 March 2010 is a great opportunity to support an up and coming Red Deer artist. 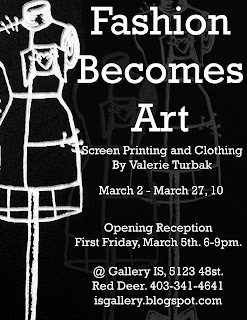 Gallery IS will be hosting the first solo exhibit by Valerie Turbak. 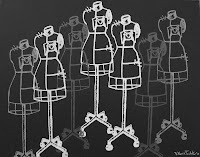 "Fashion Becomes Art" is an opportunity to see the unique vision of this multi-disiplinary artist. 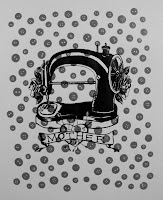 Valerie uses the art of screen printing as a bridge between art and craft by applying her designs not only to paper, but many other surfaces, most noteably clothing. "In my designs on both fabric and paper, I continue to be inspired by my love of sewing, music, vintage fashion and culture, and the low brow art movement. All of these combined have brought me great pleasure in allowing people to express themselves through what they wear and carry my art on their sleeves. " Join us on First Friday March 5th for the opening reception, from 6-9pm. This exhibit will run from March 2nd to 27th. Gallery IS presents a retrospective by local artists Erika Schulz and Jeri-Lynn Ing. 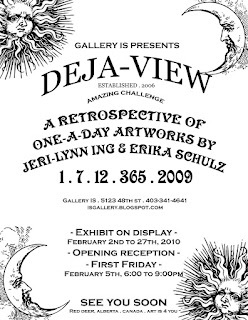 "Deja-view: A Year Of Artwork" is a look back on Erika and Jeri-Lynn's One-A-Day challenge in 2009. Both artists completed one piece of artwork every day in 2009, and this exhibit will be a commentary on the experience, and also a comparison featuring works from the first and last months of the project. There are never before seen pieces, as well as familiar works. Be sure to make Gallery IS a destination in February. This exhibit will run from Feb 2 to 27th. Opening reception will be on First Friday, Feb 5th from 6-9pm. Visitors will also be able to preview the exciting 2010 projects, in progress in our artist studios. Gallery IS, stands for Ing and Schulz. The Gallery IS was in operation from Mar 2006 to Dec 2011, and won 4 awards for Best Art Gallery in Red Deer, Alberta. Now, we are a professional art studio. We create our own artwork in the space, occasionally have an Open House, and offer small workshops. We are in the same building as McBain Camera. Erika Schulz . Blog . Erika Schulz . Website . Jeri Lynn Ing . Blog . Jeri-lynn Ing . Website . To return to this blog's main page, click the "Gallery IS" title at the top of the page.